As the Covenant transitions to an era of new leadership, we are seeking to celebrate God’s amazing work during Gary Walter’s 42 years in leadership and accelerate the momentum of Covenant ministry under the leadership of our new president. We have established a Strategic Initiative Fund for new mission and ministry. 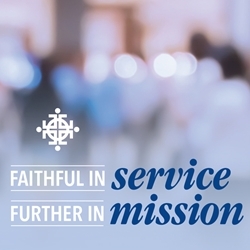 Funds raised through the Faithful in Service Further in Mission Campaign will be used by the new president and Covenant leaders for further mission and ministry growth of the Evangelical Covenant Church.